The majority of the carbon footprint of coffee production comes from the growing of coffee beans in the countries of origin. The second biggest impact on the climate is the coffee being prepared and enjoyed. Paulig’s transport, roasting and packaging each represent only a few percent of the environmental impact of coffee during its life cycle. 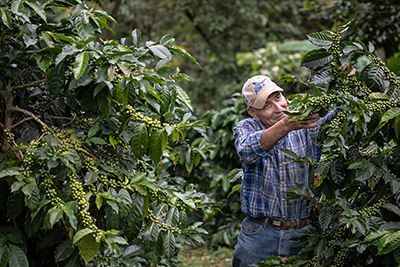 These are among the findings of a study on the climate and environmental impacts of coffee during its life cycle. The study was commissioned by Paulig and carried out by the Natural Resources Institute Finland (LUKE). Paulig actively educates farmers through its partnership programmes, and tips are also available for coffee lovers. According to LUKE’s report, the cultivation of coffee beans has the greatest climate impact regardless of the country of origin. The proportion of transporting, roasting and packaging of beans remains well below 10 per cent in the life cycle analysis. Making coffee – the preparation, recycling and washing-up of the cup – accounts for almost 30 per cent of the environmental impact. Wastage in the different stages of coffee-making contributes to this figure. “Today, the big question in agriculture everywhere in terms of climate change is how to improve crop yields and reduce greenhouse gas emissions, and even bind carbon to the soil,” says Kirsi Usva, a researcher at LUKE. “This study involved Paulig’s partnership programmes from different continents. The farming methods used by farmers can have a significant effect on the climate impact of coffee. For example, improved optimisation of water use is beneficial in all agriculture,” Usva explains. For a long time, Paulig has been involved in the promotion of sustainability and is today a pioneer in reducing the climate impact of coffee. Paulig is one of the first roasteries in Finland to roast all its coffee using purely biogas. This is reflected in the fact that Paulig’s own operations account for a relatively small percentage – only a few per cent – of the carbon footprint of its coffee. Paulig invests in sustainability in many ways. All its coffee beans are acquired from verified sustainable sources. “LUKE’s study was eye-opening. We know from our consumer research that over 70% of people consider sustainability in the cultivation and production of coffee to be important. More than half of Finns prefer to buy environmentally friendly coffee. We do development work in many areas; although the packaging’s contribution to the climate impact of coffee is small, we can further reduce the climate impact of the packaging by using bio-based materials. Our goal is to have all of our coffee packages made from 100% renewable materials by 2025,” says Paulig’s Supply Chain Director Katariina Aho. 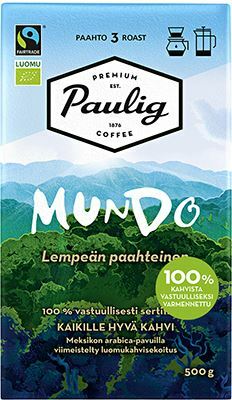 As of 2019, the packages of Paulig’s Mundo, City coffees and Juhla Mokka Organic are made from 45% plant-based and renewable raw materials. The new packages have a carbon footprint 10–20% smaller than ordinary packages. “This study confirmed our thoughts on developing our role in relation to farmers. Together with our partners, we train farmers on sustainable and profitable cultivation of coffee. Over the past 15 years, we have reached more than 100,000 coffee farmers through various partnerships. In the partnership programme, we focus on improving farming practices, such as pruning of the coffee plants and applying optimal fertilisation. We have also carried out several water projects. In Nicaragua, for example, we participated in the renovation of the San Jose De La Luz school and invested in providing the school with clean drinking water and improved the treatment of effluent from coffee processing. In addition, we try to find ways to encourage people at home and in the workplace to pay attention to coffee-making and reducing wastage. Analysing the coffee life cycle is the first step in this work,” Aho says. LUKE’s research team reviewed different coffee-making methods and the climate impacts involved as part of a life cycle analysis of Paulig’s coffee. The study revealed that filter coffee, which is popular in Finland, enjoyed black, is the best choice for the climate. “In the life cycle analysis, the role of the coffee consumer was found to be the second most significant aspect after the growing process. According to international studies, you can reduce the environmental impact of coffee by optimising the use of the coffee maker and minimising wastage. Every cup counts and every drop of coffee left on the bottom of the pot is important because it represents coffee that has been grown in vain. You can also reduce the environmental impact of coffee-making at home by switching off the coffee maker as soon as it is no longer needed,” says Usva. Reduce wastage: do not make more coffee than you are going to drink. Save on electricity: if you make a lot of coffee at once, switch off the coffee maker and pour the coffee into a thermos. The coffee will retain its fresh taste in the thermos for half an hour. Recycle used coffee grounds: compost the used coffee grounds or discard them in the biowaste bin. If you have a rose bush in your garden, you can throw the used coffee grounds under the bush. Used coffee grounds are also good for skin peeling. Washing up: wash the coffee cups and coffee pot in a dishwasher; wash only when the dishwasher is fully loaded. Recycle or reuse the coffee package: an empty coffee package is not waste: all Paulig’s coffee packages can be recycled as plastic. The laminated package material is a highly durable material that can be used for making all sorts of useful things, such as shopping bags, bread baskets, jewellery, decorative objects, snow sleds and trivets.